Developer Week: Summary Day 2, Outlook Day 3 - OMG! Ubuntu! 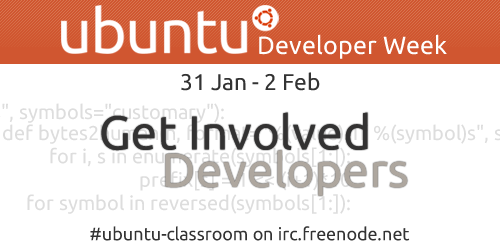 Day 2 of Ubuntu Developer Week is over and it was awesome! Logs up are up at the UDW page, so go and check them out if you couldn’t make it yesterday. David Planella kicked of day 2 and gave a well-structured session about how to get your app into Ubuntu and managed to answer heaps and heaps of questions. If you missed the session, make sure you go back and read the log. Bhavani Shankar gave an excellent session about how to take an actual source package from Ubuntu and update it to a newer upstream release. He placed great importance on all the pitfalls and explained how to make sure it gets reviewed by our Ubuntu sponsors. Mark Mims was up next and talked about juju, a great way to deploy services in all kinds of scenarios. Unfortunately he struggled with his internet connection towards the beginning, but quickly found back into the session and explained the basics and how it works. Server admins: go and check it out. Running the development release — Effenberg0x0 & Cariboo907If you always wanted to take a peek at the new development release but were afraid to do it, check out this great session by our dynamic duo Alvaro Leal and Jim Kielman. They quickly went through all the available options to do this in a safe manner, answered questions and mentioned this as a great way to play around with the new development release, to test it or to develop on it. Working with Debian — tumbleweedUbuntu is based on Debian and has a great relationship with it. Stefano Rivera took great care to explain why it is important we work closely, how to work with Debian maintainers and also where differences in the chosen infrastructure are. I was very pleased to see how much interest was in the session. Ubuntu Distributed Development — barryBazaar and Ubuntu Distributed Development have come a very way and nowadays make many many packaging and package maintenance tasks a lot easier. Barry Warsaw has been working closely with the Launchpad and Bazaar team, so he did a great job explaining how it all works and demo with a few examples how you can make use of it and how it can make your life easier. Working in Debian — LaneyIain Lane basically started where Stefano Rivera’s session stopped earlier and talked about how to get things done in Debian. He showed how Debian’s instrastructure is used and who to talk to if you might ever get stuck. Awesome! We mentioned it earlier already: Ben Donald-Wilson not only gave the session at 7:30 in the morning, but also on his birthday! We couldn’t find out if he had a long party before the session, but in any case it was an excellent session. With a small example he explained basics of HTML and CSS use. A great introduction who are new to the topic. Thanks again and happy birthday Ben! Fixing small bugs in Unity — Trevinho and andyrockItaly took over the last session of the day and it was Marco Trevisan and Andrea Azzarone who brought a great introduction into making Unity even more awesome. Everything was covered here: what’s what, where to find simple tasks to work on, how to build it, how to debug it and much much more. Grazie mille guys! You love the Ubuntu Desktop? Right you are. If you always wanted to be part of the Desktop team and help out, Sébastien Bacher has good news for you: it’s very easy to fix small bugs and be part of very diverse and fnu team. Omer Akram is up next and will make sure you find Desktop bugs to work on most easily. When looking at Desktop bugs there’s common things to look out for, there’s other projects to interact with and many more things to bear in mind. After this session it will be all clear to you. Do you like Unity Lenses? Learn how to use Singlet to create simple lenses to further enhance Unity. Michael Hall has been playing around with and can give you all the details. You have been compiling software before? Excellent. Watch Stefano Rivera’s session and see how you can build packages in a clean and safe environment very easily. In a software world with thousands of other developers, it’s important that you document your changes carefully. Bhavani Shankar will share his Dos and Don’ts with you. Jeremy Bicha will introduce you to the Ubuntu Documentation project. A team full of unsung heroes who bring clean and crisp documentation to every single release. Join in for the fun and find out how to contribute. So you wrote an app and are afraid of packaging? Don’t worry, James Westby will be here to talk about pkgme and all the goodness it can do for you. Dustin Kirkland is up next and will show you ways in which you can collaborate most easily and directly. Stay tuned for a great session about pair programming and doing code review, in the cloud! Stuart Langridge doesn’t stop at the database side of things, he will also show you how to integrate this great service tightly into your app. Stop worrying about data storage, just do it. The Ubuntu One team has lots of experience with syncing terrabytes of data across devices. U1DB is here to make data syncing for app easier. Stuart Langridge will show you how. G bor Kelemen is an expert, when it comes to internationalisation or short i18n. Sometimes problems in the code prevent the software to be translatable. He G bor will go through a list of common mistakes and show you how to fix them. Andrea Colangelo and his friends from the Italian Ubuntu developer team will be here to pick a few examples of fixed bugs and give you the blow-by-blow analysis about how it was done. Join in to start your bug fixing story today. We have to face the reality. Software comes with problems, call them bugs or defects, they are still there. Charles Profitt will be here to explain the common lifecycle of a bug report in Ubuntu and how they are dealt with.